During operation Telic, a U.K. 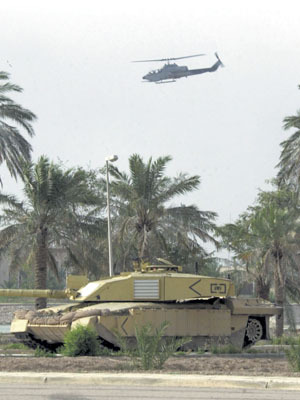 Challenger 2 and a U.S. Marine Corps Cobra support forces in Basra. Anglo-U.S. cooperation on waveform technology for the Joint Tactical Radio System (JTRS) will improve interoperability, information sharing and situational awareness by allowing forces to communicate as if they were the flanking formations of the same nation. After years of development, communications system readies for deployment in current operations. Even the most vocal advocates of Bowman would accept that the program’s lengthy history has led it to become a synonym for procurement delay. Nonetheless, Bowman’s in-service date was declared in March when the first unit, the British Army’s 12 Mechanized Brigade, successfully completed a formation-level operational field trial using two mechanized battle groups and a brigade headquarters. With the core communications element of Bowman now in place, the British Army and prime contractor General Dynamics United Kingdom Limited, South Wales, are working to ensure the readiness of the associated ComBAT, Infrastructure and Platform Battlefield Information System Application (BISA) project, or CIP, that will provide battle management and situational awareness functionality. This work now is being accelerated as the 12 Mechanized Brigade, which was scheduled to be operational by June 2005, prepares to deploy to Iraq early next year. “Bowman is not just about providing secure voice but also a tactical data ‘Internet’ on the battlefield,” explains Pete Worrall, team leader, Bowman and Land Digitization Integrated Project, U.K. Defence Procurement Agency. Bowman provides the bedrock of digitization for the British Army and the glue that holds together today’s concept of Command and Battlespace Management (Land) and the goal of network-enabled capability. Its scope is considerable with 112,000 of its personnel trained to communicate using 41,000 very high frequency (VHF) and high frequency combat net radios, 3,400 high-capacity data radios (HCDR) and 26,000 laptops in 22,000 vehicles, 230 aircraft and 133 naval vessels. The 12 Mechanized Brigade will be fielded with a capability determined to be essential for operations in 2005. The aim is to deploy with secure voice communications, situational awareness capability and data messaging appropriate for the type of operations that it will conduct in Iraq and complementary to the other communications systems already in use there. Bowman provides key improvements to capability in what has been dubbed the “three-legged stool” of voice communications, data services and situational awareness. Col. Davies explained that Bowman provides all high-quality, secure voice capabilities down to section level for the first time in the history of the British Army. “At the moment, our secure voice is normally down to battle group commander only,” he said. Bowman’s network security is managed by the key variable messaging system. Col. Davies related that this is working well and, despite the inherent complexity, has not been as much of a burden on the battalions as was originally thought. The Bowman Situational Awareness Module communicates information to Bowman users across the battlefield. This basic system is being added to ComBAT via the CIP program and will provide a common operating environment for data messaging and information management. Access to geolocation information via an embedded and external global positioning system is a key advantage of Bowman via its Automatic Position Location, Navigation and Reporting facility. “[Bowman’s] situational awareness has absolutely demonstrated what we knew it would do. [There has been] a tremendous increase in tempo—the speed of information relative to the enemy rather than just your own speed—by actually knowing where you are for certain and where the rest of your side is. It is a truism, but from our very limited exposure to date, it provides a tremendous increase in capability,” Col. Davies said. Worrall does not deny that some of the program’s technical issues remain to be resolved. “With a program of this magnitude and complexity, issues do arise, and these are resolved on a day-to-day basis through proactive management of risk.” He points out that testing revolved around the establishment of a robust high-capacity data network and the management of large ComBAT messages. Maturity of the HCDR has been slower than expected, with an adverse impact on the data network and data messaging services. Progress now is being made, and a further formation-level trial, planned since 2002, is slated to take place in November or December of 2004. Outlining some of the details, Worrall shares that the technical challenge includes establishing a mobile, self-healing high-capacity data network on the battlefield and using this network to manage the transmission of large data messages. Larry Johnson, president and managing director of Bowman prime contractor General Dynamics, explains the self-organizing, self-healing capabilities the Bowman HCDR network offers. “We are putting together the first mobile network of more than 20 nodes in the world. We are really making a breakthrough here. This is not to say that the U.S. is not moving in the same direction with WIN-T [Warfighter Information Network–Tactical], but that is years away from being fielded. A near-term data radio was never able to achieve these things, so we are really breaking some new frontiers, and we are quite happy that it has come together quite well.” The HCDR provides a high-capacity data backbone of up to 500 kilobits per second, linking clusters of VHF radios at distances of 7 to 10 kilometers. The high-capacity data radio, developed by ITT, is the data backbone of Bowman and facilitates mobile networking over the Mercury near-term data radio in service with U.S. forces. The company’s advanced digital radio and very high frequency radio provides the majority of communications down to vehicle and squad level, and its waveform will be the basis for secure frequency-hopping communications between Bowman and JTRS in the future. Johnson believes work on the necessary fixes is nearly complete. Work continued until October 1, 2004, when the system design was frozen. “This is to ensure that there is enough time before the December trial to iron out any problems and bugs and to make sure the system is ready for operational use,” he explains. Originally, the December trial was planned to demonstrate full operational readiness of the Bowman capability. However, because of a number of problems encountered during the program, certain elements of the Bowman/CIP schedule have been rearranged. Nevertheless, the intention still is to deliver a functionally complete system ready for early deployment to Iraq. “Nothing is going to be left out that will be visible to the operators. Some of the things that could be left out are systems management aspects of the systems that deal with higher levels—brigades working with brigades, for example. That capability is unnecessary for the 12 Mechanized Brigade [in Iraq] and something they will not miss,” Johnson says. Where possible, developers are taking advantage of this rescheduling to introduce some functions earlier than originally planned, he shares. Not added to the Bowman capability contract until December 2002, but integral to its performance, is the CIP, which provides the ComBAT battlefield management function that exploits the Bowman radio transport layer. The optimistic goal for the CIP was to accelerate development so that it would be ready for Bowman’s in-service date in March. However, the issues with Bowman HCDR network stability in March had an impact on the messaging on which the CIP relies. This dissatisfaction with elements of the CIP’s performance resulted in the need to move the trial to July. “Situational awareness and messaging are working very well within CIP. We have had some problems in getting the messages through the network, but those parts are now all on schedule [for the December trials],” Johnson says. These messaging problems were in part alleviated by a contract amendment for additional software that better caters to large-scale messaging. As with Bowman proper, some elements of the CIP will be postponed. This, however, will make little functional difference. “The commander of the 12 Mechanized Brigade will not know the difference. These are refinements that will come from now on. What we are giving them now is a 90-percent solution to the CIP requirement, but nonetheless a very stable solution,” Johnson says. Along with the technical challenges of radio frequency communications, the General Dynamics team has had problems outfitting the vehicles with the Bowman solution. Johnson admits, “We underestimated the difficulty, absolutely.” The delays have occurred for a number of reasons. First, more than 400 vehicle designs have had to be reviewed and endorsed. This has been further complicated by the fact that vehicles have, in many cases, been modified in the field and look different than expected. In addition, the British Army wanted Bowman to be installed in its Warrior IFV, an armored infantry fighting vehicle, and coordinated with the separate Battle Group Thermal Imaging program to provide a night-vision capability upgrade for IFVs. With the core aspects of Bowman now set, General Dynamics is seeking to use the experience it has gleaned from working on the program to offer a similar solution outside the United Kingdom. “The challenge for us is to be able to tailor the system to customers’ needs and budgets. There are very few countries that can actually afford a Bowman,” Johnson says. Many potential customers already have a number of component communications systems but lack an integrated solution. Bowman offers a “big bang solution” with a complete rollout of communications and battle management system functionality in one package—though progressively—to the land, littoral and air maneuver communities, Johnson says. “What other countries need is the completion of a system so they can transmit data and obtain situational awareness and battle management tools. The challenge for us is to canvass the world and find out what their needs are and to tailor something to those needs,” he maintains. General Dynamics is in discussions with five potential customers who do not need the full “Bowman solution,” he relates. The United Kingdom and the United States are working together to create a network in which U.S., U.K. and coalition units will be able to share information and situational awareness as if they were the flanking formations of the same nation. Worrall explains that the joint program aims to model the Bowman waveform and algorithms on Joint Tactical Radio System (JTRS) radios so that future coalition operations between Bowman-equipped U.K. troops and JTRS-equipped U.S. forces have a secure voice and data radio capability in fixed-frequency and frequency-hopping modes. The U.S. recently awarded ITT, manufacturer of both the HCDR and the advanced digital radio and VHF radios, or ADR + VHF, phase two of a contract to prepare the VHF waveform for testing before being accepted by the JTRS Joint Program Office waveform library. When complete, this work will enable a direct over-the-air voice and data interface between U.S. and U.K. forces using the Bowman VHF waveforms, up to and including communication in frequency-hopping mode. The Bowman waveform is to be included on the JTRS Cluster 1 radio under the current operational requirements document, but not on the Cluster 5 radio as it stands today. U.S. Army officials expect the British waveform to be included by early 2005. Although Bowman is a substantial part of interoperability between U.K. and U.S. equipment, it is not the only solution, Worrall emphasizes. “We are working with U.S. colleagues on a Coalition Blue Force Situational Awareness concept capability demonstrator, targeted to deliver the U.K. blue force picture into the GCCS [Global Command and Control System], FBCB2 [Force XXI Battle Command Brigade and Below] and other U.S. joint blue force situational awareness systems in September 2005—and vice versa—and be capable of fielding in early 2006. This is separate from other U.K./U.S. work on JTRS and battlefield target identification,” he says. Conversion of the next Bowman brigade, the 7 Armoured Brigade, began in July 2004, and four additional brigades will receive Bowman equipment by early 2007, with ongoing trials throughout the period. By early next year, the 12 Mechanized Brigade will be deployed in southern Iraq. Adam Baddeley is a freelance technical writer based in the United Kingdom. He specializes in the area of command, control, communications, intelligence, surveillance, target acquisition and reconnaissance.